In this week’s roundup of web design and development resources you’ll learn five design tips to prevent shopping cart abandonment, discover why we should reframe accessibility as a technology challenge, find out about a new CSS reference, and more. If you’re new to my blog, each Friday I gather some of my favorite resources for user experience, accessibility, WordPress, CSS, HTML and responsive design and publish them in a weekly resource post. If you like what you see, share the post with your colleagues and friends. Want to get these updates on a daily basis? Follow me on @redcrew on Twitter. This week’s photo is of the snow mushrooms in my backyard, after the almost 17 inches of snowfall we received in the Detroit area earlier this week. I can’t complain, my friends in northeast United States have been inundated with snow the past couple weeks. "Design matters" vs. "We don't have budget for design." Only one of these tells the truth about the organization's values. 5 Design Tips to Prevent Shopping Cart Abandonment: Getting the user to complete the checkout process is a lot easier with these tips to simplify the interface and only display necessary options. Good tip: don’t spoil the checkout process by requiring the user to register. 3 things poor interfaces and zombies have in common: Markus Pirker playfully compares poor interfaces with zombies, and finds there are many similarities. My favorite is number 3: they are no masters of articulation. 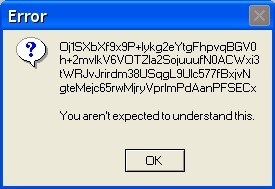 Who hasn’t come across language in an error message that makes no sense? February 2015 User Experience and Web Professionals Events: Find out about this month’s user experience and web professionals events in southeastern Michigan with my monthly events calendar. How To Get Yourself Started With UXPin: In this tutorial, my friend Tom Green walks you through steps of using UXPin, a browser-based prototyping tool. You’ll learn how to create a wireframe, use the interface, add text/images/buttons, add interactivity, and test your page. An Exploration in Material Design: Arthur Bodolec, Design co-founder at feedly shares his exploration of redesigning feedly using Google’s Material Design principles. Reframing Accessibility for the Web: Anne Gibson points out why we should rethink what web accessibility means and reframe accessibility as a technology challenge. Web accessibility means that people can use the web. Captioning Videos in Facebook: Great to see this new feature for captioning Facebook videos: you can now add captions in any language. One of W3C WAI’s finest – an interview with Shawn Henry: Through her work, and the work of other employees and volunteers at WAI (Web Accessibility Initiative), Shawn Henry has helped change views about disability and improved the accessibility of the web for millions of people. In this Access IQ interview, Henry talks about how she started in web accessibility, improvements she’s seen in the past 20 years, and how she strives for work-life balance. Keyboard Accessibility with the Spacebar: Ted Drake takes a look at how interactive elements work with the space bar. As long as developers user proper, semantic code, there’s usually no issue, said Drake. YouTube admits automatic captions have a way to go: While having captions is better than not having captions, YouTube’s product manager says there’s more room to improve speech recognition. Why Jetpack Isn’t a Collection of Plugins, Part the First: WordPress core contributor George Stephanis explains dependency management and how modules in Jetpack use a common library for much of their functionality. A Simple Snippet to Force SSL for Your Whole Site: Even after making the change on your site from HTTP to HTTPS, if you want to force pages to load HTTPS for your entire site, Dave Clements recommends you add this code snippet to your functionality plugin. WordPress 4.1 vs WordPress 4.0 Performance Comparison: In his test environment, Tim Butler saw noticeable performance improvement in WordPress 4.1. Empowering Women in WordPress: In her WebDevStudios post, Suzette Franck points out the need to encourage and support women as speakers and leaders in the WordPress community. WordPress Hooks: Beginner’s Guide to Adding Your Own Hooks: If you’ve been wanting to learn about adding hooks in WordPress, this tutorial will explain why you need hooks, how they work, and how to create hooks to extend your plugins or themes. Real World Responsive Web Design: Jason Grigsby, co-founder of Cloud Four, chats with Jared Spool about our approach to web design, performance, and the blurring of lines between designers and developers. You can listen to their chat as a podcast or read the transcript. Responsive Navigation for 73+ Languages: Aaron Barker discusses the challenges of having navigational design and their text labels display correctly across 73 languages. I remember when I first came across this issue more than two decades ago, as software application release coordinator for German and French versions. 44 Responsive Web Design Resources: The Ultimate List: Claire Dansey has compiled an amazing collection of books, podcasts, articles, online tutorials, frameworks, and testing tools for responsive web design. Introducing the Codrops CSS Reference: I imagine Codrop’s CSS Reference, written by Sara Soueidan, will become the go-to resource on CSS for many designers and developers. You definitely want to bookmark this site. I Wrote A CSS Book Referencee: Sara Soueidan talks about writing the reference, why it was published on Codrops, and what she learned as she wrote it. Setting an Example: We’ve all been there: quickly writing a snippet of example code with the purpose of explaining a specific concept, but not making the code production quality. We need to set a better example, says Ian Pouncey, and create example and demo code that is production quality. Why I use both the Cloak and Private Internet Access VPN services to secure my Mac and iOS devices: Having one VPN provider may not be sufficient to protect your devices connected to public wifi access, says Matt Henderson. Feb. 12 webinar: Public speaking scares me. Should I do it, anyway? : If you’ve been hesitant to speak in public at local meetups, business events, or conferences, sign up for this free Google Hangout webinar next week. My Internet colleague Denise Graveline will discuss what can cause public speaking nervousness and ways to overcome it. Your U.S. Small Business and Tax Information Forms: Did you know that if you made payments electronically by credit card or payment card and certain other types of payments, including third party network transactions , you’re not required to issue a 1099-MISC to the payee? You’ll find more information about 1099-MISC forms, U.S. quarterly tax payments, and Employer Identification Numbers in this collection of resources and helpful tips. Thanks, Marcy!